Sorry about the awful photo; it was the best that I could do. 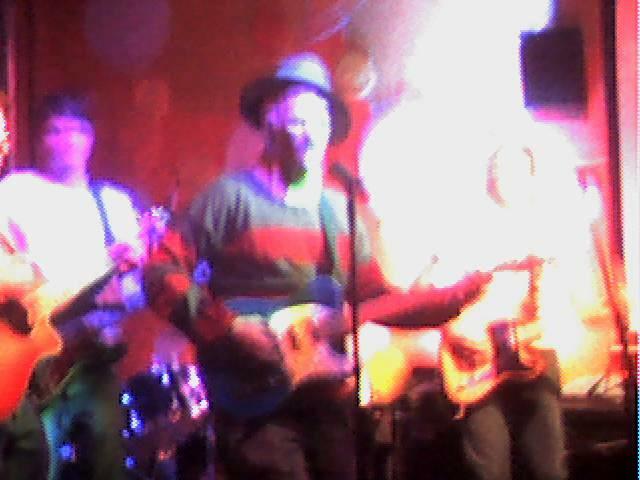 “Freddy Krueger Mellencamp” at Orbit last night was a big hit with this homesick Hoosier. Part Farm Aid, part Nightmare on Elm Street, the show was true to its billing, right down to the cigarettes rolled up in a t-shirt sleeve. At first I was afraid the band might actually be intending to poke fun at the musical stylings of one of Indiana’s best known natives, but the show was pure tribute to the singer, songwriter, instrumentalist, philanthropist, and shiller of American-made products. Mr. Krueger was given his full honors as well and gave a frighteningly good performance. There was rain on the scarecrow, and blood on the plow. Best of both worlds. The possibilities are endless. Or not. We’ll see. Leave your scary suggestions in the comment section.